Kabocha squash—with its creamy center and edible skin—doesn’t need much adornment. In this recipe the elegant squash is roasted and then garnished with a pleasantly tangy and nutty pecan-raisin relish. It is made with raisins, apple cider vinegar, chopped pecans, fresh parsley and cilantro, and just a touch of maple syrup. This creative preparation really brings kabocha squash to a whole new level. 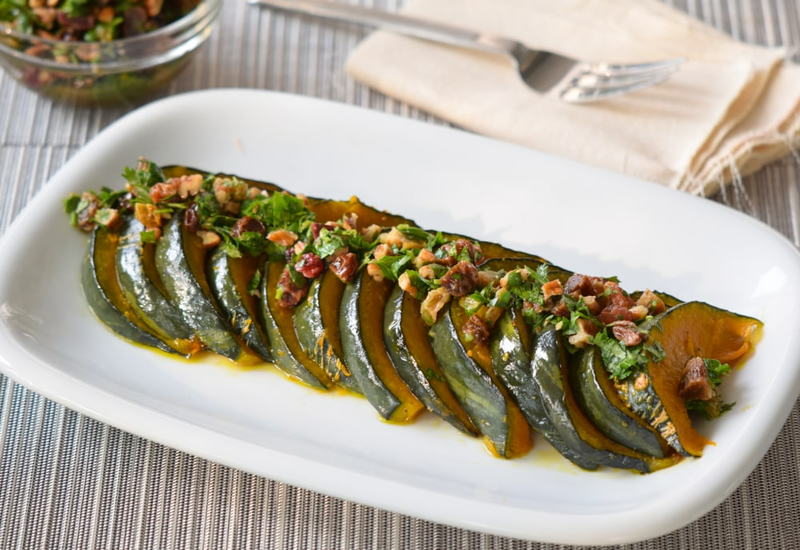 If you can’t find kabocha squash, butternut or acorn squash can be substituted. However be aware, those varieties must be peeled and may need to cook a bit longer. Per Serving: 312 calories; 20g fat; 33.8g carbohydrates; 3g protein; 0mg cholesterol; 186mg sodium. Kabocha squash is so underrated! This dish was really good. I also really enjoyed the cilantro-molasses relish, it was delicious. This is perfect for holidays, special occasions, or small gatherings with family and friends. This was an easy squash roast and the relish was delicious. I thought the pecans and raisins added a nice crunch and flavor to the relish. Very good. This was a hit at our Thanksgiving table! I didn’t have pecans or raisins so I subbed toasted pistachios and sunflower seeds and dried cranberries and it was delicious.